Kim Cobb and others published January 3 in Science Magazine a paper exploring 18Oxygen in coral cores as old as 7000 years. Living coral was not drilled. While showing some increase in amplitude since 1970, the strongest El Ninos in the 7000 year span occurred about 400 years ago during the Little Ice Age. 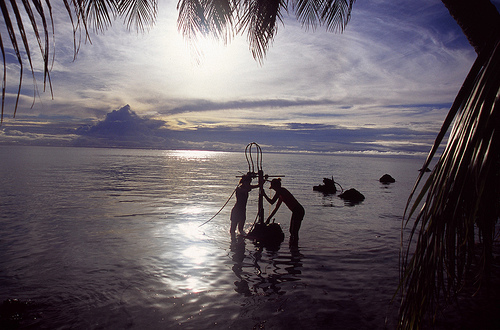 Here in a picture from UCSD they are drilling in Coral “rocks” that have been broken off the reefs. Besides the strongest El Ninos and the Little Ice age, the early 1600’s were characterized by sporadic outbreaks of plague, the heyday of Sir Isaac Newton, the English Civil War, and the sailing of the Mayflower. This entry was posted in Climate, Climate Change, History, Paleoclimate. Bookmark the permalink.